So much cool stuff is happening in libraries now. The day I went in to hang this show, there was a guy demonstrating 3D printing. You can take classes at the library in 3D printing now, and rent time on their machines. Cool, right? I’m not quite ready to abandon paint yet, though. Here are the installation pictures. 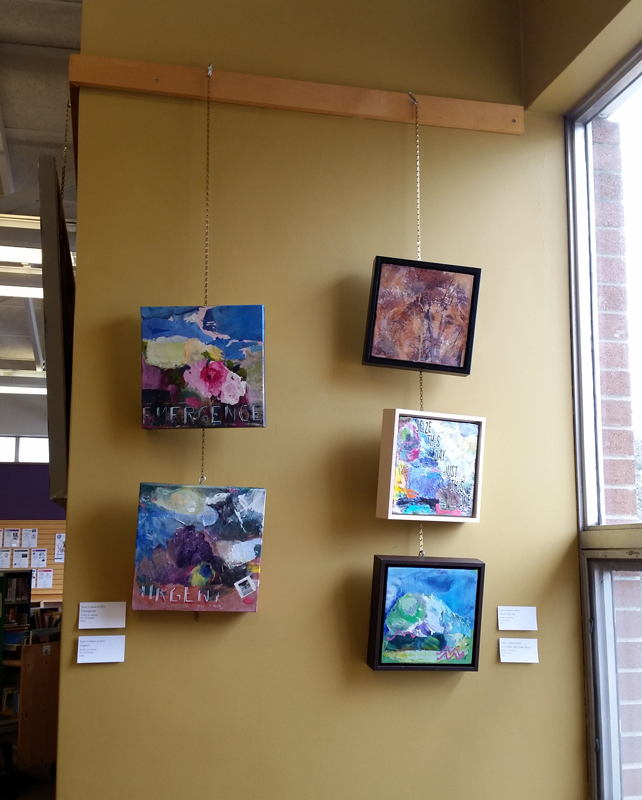 This exhibit will be there to see until April 27. This entry was posted in Uncategorized on April 13, 2018 by Susan. I’m delighted to be part of Red Head Gallery‘s Nuit Blanche exhibit this year, called Who Are You? “The Cinderella Stories” is a series that explores the mythology, culture and experience of corporate capitalism through my personal lens of a female participant. After I left a corporate career in 2001, I spent a lot of time re-evaluating my beliefs about myself and about the world of business. Art was a natural way for me to tackle working through these thoughts and emotions. 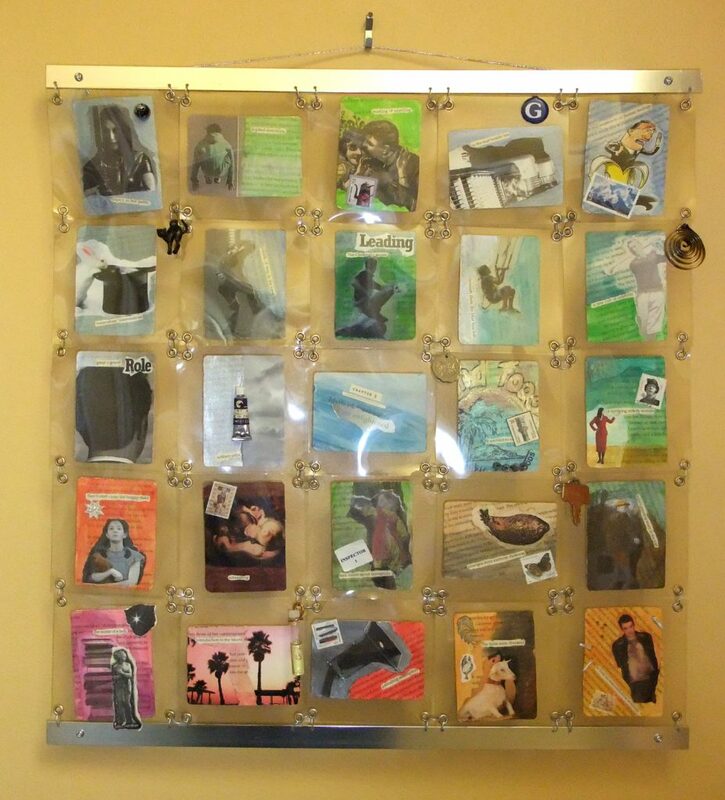 This work started as individual artist trading cards, created by laminating a set of casino playing cards with old book pages, then collaging and painting on them, while preserving meaningful words. Mounting them together in the form of ‘quilts’ provided a feminine form to contrast with the comments on corporate capitalism embedded in the small pieces. The addition of objects of personal significance provides a dimensional and archival quality to the pieces. The links evoke for me the need for personal armor in the organizational context. Each of these quilts is conceived of as a chapter in a book that charts the indoctrination and path to enlightenment of the artist. The “Who Are You” exhibition is the first time these very personal pieces have been shown in public. They were created over a period of time, then mounted together as you see here. Mounting these artist trading cards was a tricky process. I created this form, which I call a “quilt” because of the way pieces are assembled. I no longer use the casino playing cards as a substrate, because they warp easily, even after being laminated. So now I use heavy watercolor paper as the starting point. The images collaged onto the cards come from a wide variety of sources, including my own photographs and rubber stamps I have created. I do love making these, but have gotten away from them in recent years. In part because I was not sure I would ever be able to show them. When I saw the opportunity with Red Head Gallery, it seemed like a perfect fit. So I may now be inspired to do a few more in the series. 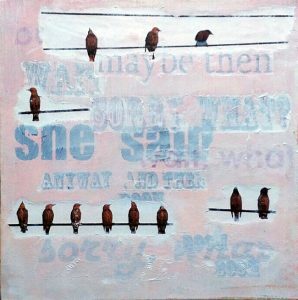 This entry was posted in Studio paintings, Uncategorized on September 29, 2017 by Susan. Why paint something more than once? 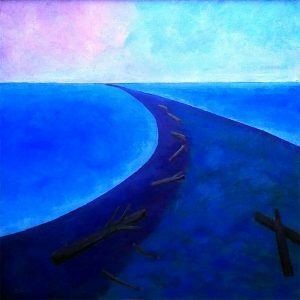 I have painted this scene from the southern tip of Pelee Island three times so far, but could be quite happy painting it again. A guest at my opening reception asked me why. Many great artists have painted a given subject many times. Monet painted his garden and water-lilies about 250 times. 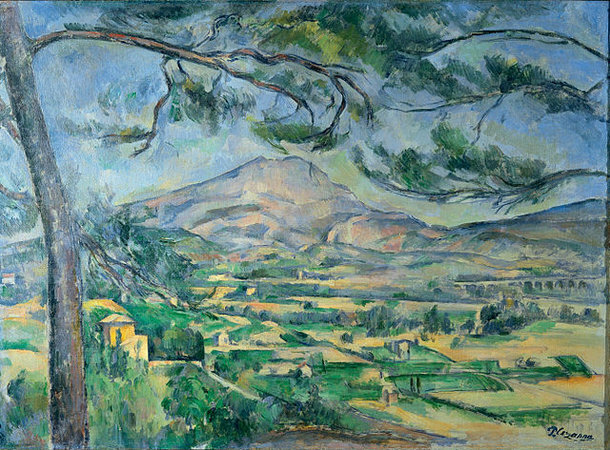 Cezanne painted Mont Sainte-Victoire some 60 times. Here’s one example, from the Philadelphia Museum of Art. Here’s another example of the same subject, painted several years earlier, from the Courtauld Gallery. By working with a familiar subject, he would have been able to try many different approaches to the subject — different brushwork, different color selections, different levels of abstraction. Over time, he pulled away from impressionistic approaches of capturing the moment, and became more studied in his approach. 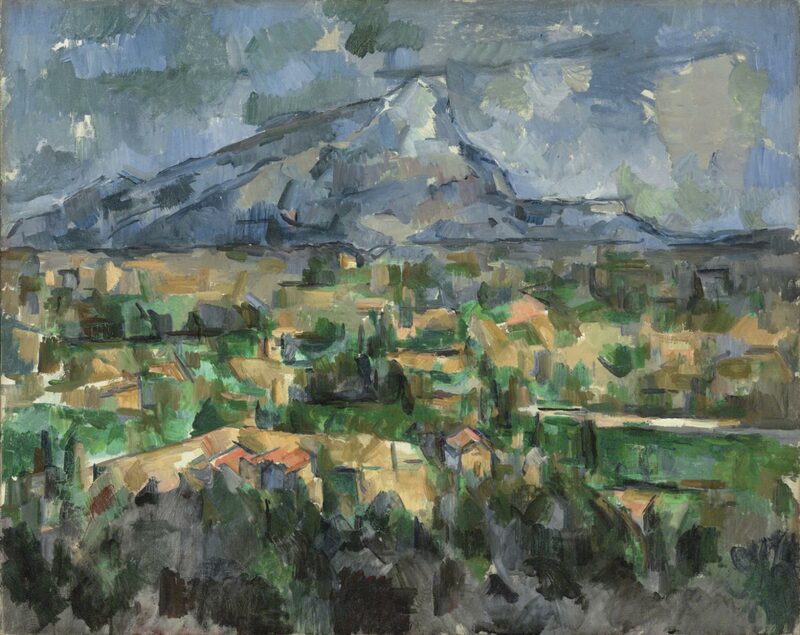 Cezanne was greatly influential on other painters of his time and now, although he was not tremendously successful in his own time. This entry was posted in Uncategorized on April 21, 2017 by Susan. Driving home from the Haliburton region, there’s a little diner by the lake in a tiny place called Cameron. It’s in the Kawartha Lakes district, which is part of the Trent-Severn canal system, so you can take a boat from Lake Huron to Lake Ontario. At one time this would have been used for commercial shipping, but now it is primarily a route for pleasure boats. There’s a small deck, a docking area for the little marina where the houseboats stop on their travels. I love the marshy edge of the lake, and this odd tree that is bent over by the wind and looks oddly tropical. This day in August was very hot, with the kind of humid overcast that creates a lot of glare and haze. It’s not really clear and its not really cloudy. You just know there is going to be a thunderstorm by late afternoon on a day like this. Far too hot to be outside on the little deck, we sat inside the diner for our fish and chips. I had a lovely chat with the server who was very interested to learn more about my art, and has done some painting herself. Only a short stop, then we bought some cold drinks, and headed back out to the main highway. Once back home and ensconced on our own little deck, sure enough, there was a thunderstorm. Something we can enjoy from a safe and dry spot. This piece is currently hanging in my home, until it finds a new home. Here’s a little picture of what is looks like in my hallway. You can see the cradle mounting for these panels sets them off the wall nicely, even if there is no frame. This entry was posted in Uncategorized on April 14, 2017 by Susan. I delivered two more of The Highway series paintings to the new owners yesterday, and both were so pleased, it made my day. Pelee in Blue was the larger painting, made from this small study, which was purchased by another artist I admire. 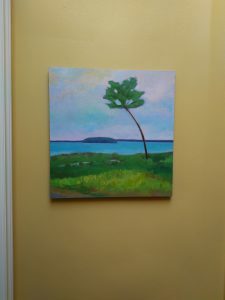 For her, the smaller painting has a freshness and energy that she valued. Dropping off the work at her home yesterday, it was wonderful to have a tour of her other paintings; she owns many wonderful pieces. And I was proud to have my piece taking its place in her home. A collector is scheduled to come by to see the latest work, and so I have a selection of pieces I think she will like all ready in my little sun room. Are the paintings happy to be there, instead of stored away in shelves? That is a whimsical idea, but I like it. Surely objects want to be useful and loved, just as we do. A friend asked me why I would paint the same subject multiple times. More on that in the next post. This entry was posted in Uncategorized on April 13, 2017 by Susan. People are asking me what inspired the works in The Highway series of paintings. That’s easy to explain in one way — it is the view of the countryside I can see from the passenger window of our car as we drive to various destinations when we travel in Ontario. I’ve been taking a lot of photos from the car, putting my camera or phone up through the sunroof. (Not while driving!) The horizon line you see in a car is invariably slanted, and this is starting to show up in my paintings. When I was working en plein air (fancy artist term meaning outdoor painting) I was often right at the edge of a highway, because there is nowhere else if the forest is thick. Take Algonquin Park, for example — most of the time you are parked just off Highway 60, the main corridor through the park, painting something that is visible from the highway. I did do some growing up in the prairies, and lived in Calgary for many years, so that landscape is always present in my imagination. And some of the works have that sense of spaciousness of the prairies, such as Big Sky, shown below. But they were still based on the Ontario countryside. All the inspirations are Ontario countryside with one exception, which was purely from my imagination, the diptych Avery Beach. It is actually based on remembering English Bay in Vancouver. 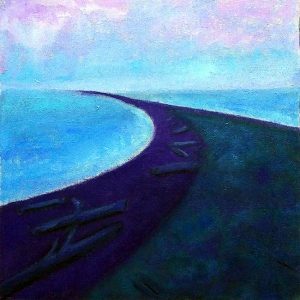 But it is called Avery Beach because I was studying the work of Milton Avery at the time, so the title is a tribute to that influence. 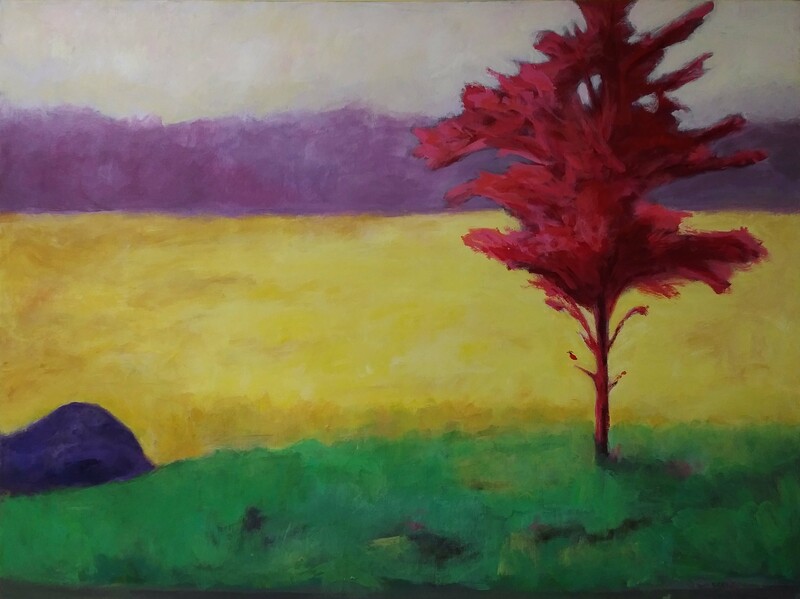 From an artistic point of view, I am exploring the ways of capturing a sense of space, and the interplay of colors, while simplifying the landscape. I have four pieces in the Don Valley Club’s fall show, shown here. The show is at Todmorden Mills, and runs from 16 November to 27 November. These first two are part of an ongoing series I have been doing experimenting with words and image transfers, and some gentle humor or wit. They work well alone or as a pair. If you only see one hanging on the wall, ask to see the other, which may still be in the back. These are unframed, but are painted on 1.5″ gallery canvas, with the edges painted in gray, which I find hangs quite nicely with no frame. I love imagining that these birds have the same idle conversations that other neighbors have when we chat on our street! If you’ve ever been to Pelee Island, you’ll love this view as much as I do. Pelee Island is the southernmost point in Canada, and a beautiful place to visit. There is a very long natural spit that seems to connect to the distant horizon, making lovely shapes. The small piece was the study for the larger piece, shown below. 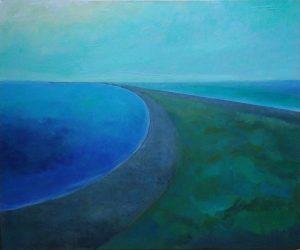 I painted one more version of this image (not in the DVAC show), called Looking South at Pelee. For this one, I used an oblong format, simplified the composition even further, and changed the color scheme to be even more calming. This entry was posted in Uncategorized on November 16, 2016 by Susan. The fall show and sale for the Don Valley Art Club is coming up soon, and I will have a few pieces in the show. This particular show is set up so that if you buy something, you can take it with you immediately, not have to wait until the end of the show. Opening: Wednesday November 25, 7:00 to 9:00 pm. The show is on until December 6. Todmorden Mills is at 67 Pottery Road, where there is free parking and free admission. The gallery is closed Mondays and Tuesdays, open noon to 5:00 pm weekdays, and noon to 4:00 pm weekends. 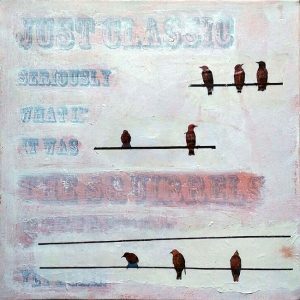 This show is always popular for the wall of square paintings available at $144 each. These are 12 x 12 inch original pieces. The cabin we rented in Halliburton last summer was on the water, and we had the most spectacular sunsets, with amazing combinations of almost neon colors. With the fading light filtering through the tall thin trees at the water’s edge, I just had to capture this mood in a painting. I thought the finished piece looked oddly tropical, despite being in the near north, hence the name. 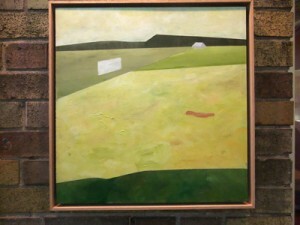 It’s part of the Near North series of paintings. This piece is another in the Highway Series, where I have abstracted the landscape visible from the highway. The blocks of color are carefully selected and layered to produce a calm mood, and a sense of spaciousness. This is the first of what will be a series that I think will be called Broken Words. It uses a new method of transferring printed images that I have developed, and am getting good results with. The letters have been finished with a high-gloss gel that makes them stand out from the matte finish of the paint, something that does not come through very well in the photo. There are many fine artists that show with the Don Valley Art Club, and you will not be disappointed if you make the time to stop by. For more details about location, check here. This entry was posted in Uncategorized on November 23, 2015 by Susan. I am delighted to have two of my recent pieces going in to the juried NEXT! show at the Arts and Letters Club. This is an amazing club that looks like Hogwarts on the inside, and has been in existence since 1908. Many famous writers, painters and musicians have been members. The club runs an open submission juried art show, and I am so pleased to be a part of this event, since they select only 45 pieces. The two pieces I will have in the show are Cooper’s Farm with Sketchbook Page, and Three White Buildings and Triangle, shown below. Details about the show and public access dates are on the Arts and Letters Club Web site here. This entry was posted in Uncategorized on September 24, 2015 by Susan. 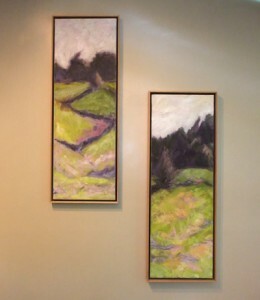 Also hanging in my sun-room are the two vertical pieces, called Shapes and Shadows 1 and 2. I think this view gives a more accurate impression of the colors, which came out a bit strong looking in the other photos posted. These two paintings work well side by side, I think — they were actually painted from the same source material — but they also work well on their own. 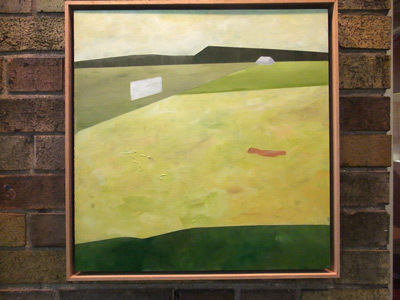 *Hard Edge painting is a term that dates from the late 1950’s. You can read more about it at the Guggenheim or the Tate. Or have a look at some of these paintings from Takao Tanabe. This entry was posted in Uncategorized on August 31, 2015 by Susan.